HMAS Tarangau was a Royal Australian Navy shore establishment situated on Lombrum Point, Los Negros Island lying approximately 320 kilometres north of mainland New Guinea, two degrees south of the Equator. It was often referred to as Manus Island from which it was separated on the west by a narrow channel. Today a bridge connects the two islands which along with others form the Admiralty Islands group. Manus Island is approximately 80 kms long and 25 kms wide. During the Second World War Manus Island was occupied, but not heavily fortified, by the Japanese. An airfield was constructed at Momote on Los Negros Island but little effort was made by the occupying Japanese to exploit the attractions of Seeadler Harbour with its more than 100 square miles of deep-water anchorage. Nevertheless, the Admiralty Islands were of great strategic importance and in January 1944 the Allies moved to recapture them. This was achieved by mid-April with only small scattered parties of Japanese remaining. The recapture of the Admiralty Islands left the way clear for the Americans to develop Seeadler Harbour, a natural harbour protected by a barrier reef and 11 smaller islands. Some $2.6 million was invested by the US on development that included constructing additional airfields, roads, power plants, water reticulation, fuel and ammunition storages, a headquarters, barracks, a communications centre, post office, and a 1000 bed hospital supplemented by three smaller facilities. Extensive wharfage and landing stages were constructed along with workshops and other support facilities along the foreshore including floatplane repair facilities. Within the harbour, floating docks, some capable of accepting battleships, were added to provide additional battle damage and repair capability. Towards the end of the war Manus Island had become one of the largest US bases in the Pacific and it was a critical staging point for the Allied attack to liberate the Philippines. On 11 October 1944 more than 200 ships could be found at anchor in Seeadler Harbour including: 6 battleships, 20 aircraft carriers, 9 cruisers, 42 destroyers, 3 submarines, 42 destroyer escorts; and 85 auxiliaries. HMAS Tarangau formally commissioned on 1 April 1950. 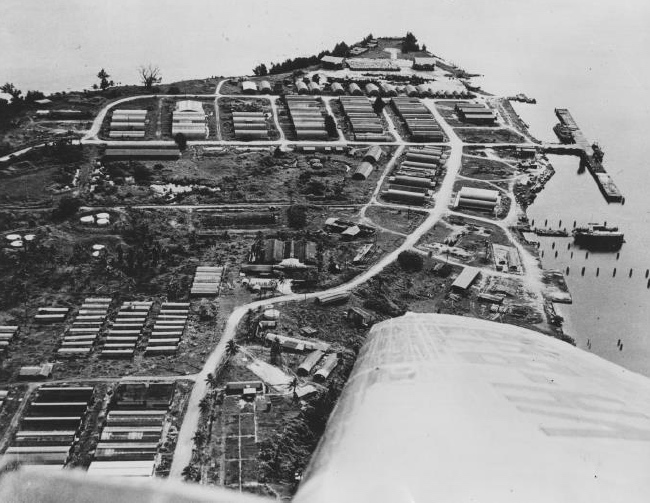 After World War II, the RAN established a single advanced naval base at Dreger Harbour near Finschafen on the New Guinea mainland. It was used chiefly as a forward operating and logistics base. Late in 1945 the US Government made proposals to Australia concerning the future of the Manus Island naval base. In March 1946 the US Secretary of State proposed the US be given long term base rights at Manus Island to be shared jointly with Australia. Discussions ensued for some 15 months after-which the US decided to withdraw. The US later contracted to sell all moveable and navy fixed assets to the Chinese National Government, with the Australian Government taking over the remaining assets. In 1949 the RAN moved from its existing base at Dreger to establish an advanced naval base at Lombrum Point on Los Negros Island. The facility commissioned as HMAS Seeadler on 1 January 1950. However, the name Seeadler, meaning ‘sea eagle,’ had links with German Imperialism which was considered an inappropriate name for a RAN shore establishment. Consequently the name was changed to Tarangau, a word native to that region with the same meaning, and that used at the former depot at Dreger Harbour. 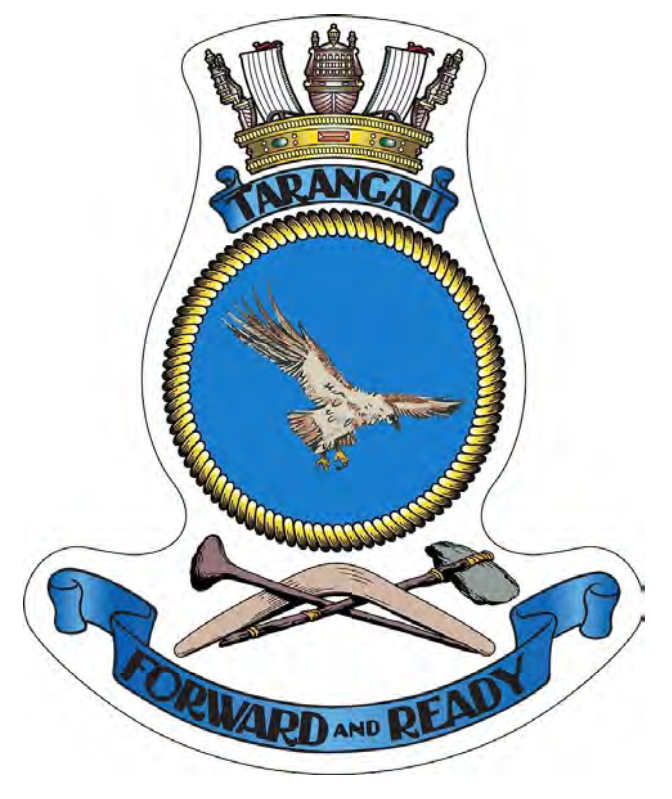 On 1 April 1950 the base officially recommissioned as HMAS Tarangau. The primary role of HMAS Tarangau was to provide forward fuelling, logistic, communications and maintenance support to ships of the RAN and to assist in the training of members of a Papua New Guinea Division of the RAN. In the early 1950s it was also home to some 150 Japanese prisoners of war, most of whom were serving time for war crimes and who were put to work as labourers. In that capacity they built a number of facilities including a church and a swimming pool. Five of their number were executed at Manus Island in June 1951 following convictions of murdering Australian prisoners-of-war in circumstances described as ‘barbarous and revolting’. An overflight of Tarangau showing the wharf area and rows of WWII era Quonset huts that were used variously as workshops, storage facilities and for accommodation. HMAS Tarangau was manned continuously by RAN officers and ratings throughout its 24 year commission. Externally, the appearance of the base changed little since the end of World War II. Numerous Quonset huts erected during the war remained in situ being used variously for accommodation and as workshop and storage facilities. Later more permanent housing was constructed but the presence and destructive nature of white ants proved a continual source of worry throughout the life of the base. The climate too was challenging, being tropical with an average temperature of 27.1 °C and significant rainfall even during the driest month. About 3500 mm of precipitation fell annually. The effect of the climate on infrastructure necessitated a continuous maintenance and repair regime in the battle against rot, rust and decay. The Manus Island area was essentially a healthy one, even though it was in a malarial region, and outbreaks of the disease rarely occurred in Europeans as long as they took prophylaxis. Other tropical maladies such as coral sores, ulcers and tropical ear infections were common but easily treatable. The remoteness of Tarangau meant that there were very few facilities, apart from picnic spots, outside the establishment. The nearest town was Lorengau some 22 kms distant by road with a small European population, three stores and a club. This necessitated establishing recreation facilities within the confines of Tarangau including a wardroom, senior sailor’s mess and a junior sailor’s mess. Film nights were conducted frequently, as were sporting activities ranging from tennis, basketball, soccer and softball to swimming and sailing in dinghies. Rugby was not normally played due to the risk of infection caused by coral cuts. There was also a library and small store/canteen. Unaccompanied volunteer personnel were posted to Tarangau for 12 months service and they had to be prepared to accept living under Service conditions throughout that time as there were no facilities to eat or sleep outside the establishment. Postings to Tarangau were considered as sea service for the purpose of sea/shore rosters. Unaccompanied personnel were not entitled to any leave travel at departmental expense during their posting although they were permitted to take up to seven days advanced seasonal leave after six months. The cost of any travel on such leave was normally subsidised by a Ship’s Fund up to the amount of a return air fare to Rabaul. Approximately 50 per cent of RAN senior sailor’s billets in Tarangau were for unaccompanied personnel who lived in single berth cabins and who took their meals in a cafeteria within the senior sailors mess. Junior sailors were accommodated in dormitory type blocks containing cabins for six persons. Their meals were taken in a junior sailor’s café adjacent to the main galley. Accompanied personnel were posted to Tarangau for periods of two years and at the time of volunteering they were required to present a signed assurance from their spouse that they were prepared to go to the New Guinea area and were medically and dentally fit to do so. Married quarters in Tarangau comprised either two or three bedroom furnished houses which included a refrigerator and a washing machine. For those personnel with children there was a pre-school in Tarangau for children aged from three to five years complemented by the Lombrum Primary school that taught the NSW curriculum from prep to 6th class level. There were no facilities for the schooling of Australian high school age children. All members posted to Tarangau were expected to play their part in helping to establish the PNG Defence Force, which was an important facet of local engagement. Contracted indigenous workers made up the local work force receiving pay, food, clothing and shelter in return for their labour. As many of the labourers came from mainland Papua New Guinea, having followed the RAN when it relocated from Dreger Harbour, an arrangement was made to fund the return of them to their homes every two years. Many of those men were to later become skilled tradesmen such as electricians and carpenters. Every six weeks a supply ship would arrive from Sydney with stores, beer and food at which time all work would cease until the ship was unloaded. This normally took several days. Two RAN motor refrigeration lighters, MRL 252 & MRL 253, also served consecutively at Manus Island in the early 1960s as did the General Purpose Vessel HMAS Banks and HMAS Kangaroo. As an initiative to allow the people of PNG to contribute to their own naval defence a PNG Division of the RAN was approved on 3 June 1948. In August 1951 the first batch of 19 Papua New Guinean recruits joined and training began on 1 September. Thereafter training continued until Tarangau decommissioned in 1974 prior to PNG gaining independence. The opportunities afforded by the scheme proved popular among young Papua New Guineans and by 1960 the division comprised 99 men. After initial training recruits were divided into specialist categories ranging from radio electrical mechanics through to radio operators, stores assistants, writers, engineering mechanics, sick berth attendants cooks and quartermaster gunners. All categories were trained in Tarangau which had a full-time instructional staff comprising six officers and six senior sailors. Sea training was initially conducted in small support craft assigned to Tarangau and by the early 1970s five Attack class patrol boats were operating from Manus Island and routinely crewed by PNG personnel recruited largely from the mainland and islands of Papua New Guinea. These vessels: Aitape, Lae, Ladava, Madang and Samarai each carried indigenous names performing valuable work patrolling the vast coastline, rivers and estuaries of Papua New Guinea. Throughout the 1960s and early 1970s Tarangau was a frequent port-of-call for visiting RAN and Allied warships travelling to and from South-East Asia as part of the Far East Strategic Reserve or en-route to South Vietnam. By 1971 more than 1600 people lived in Tarangau which had become a complete community served with electricity, water, oil, sewerage, food supplies, roads, schools, a postal service and fully equipped and staffed hospital. This was a key piece of infrastructure serving both RAN personnel and members of the local community. By the early 1970s three sisters of the Royal Australian Navy Nursing Service complimented a mixed European and Papua New Guinean staff. The hospital was equipped with 32 beds plus a two-bed intensive care ward. Midwifery facilities were included and a number of new-borns came into the world in Tarangau. Weekly infant welfare clinics were also a popular feature of the hospital’s services. The Royal Australian Air Force was also present at the Manus Island Group maintaining medical facilities, an air-sea-rescue service as well as workshops and storage facilities. Although no aircraft were permanently stationed at the base, regular exercises were held with RAAF aircraft based from Townsville. The 7800 foot long airstrip was also used daily by commercial aircraft and US planes operating from Guam. The Australian White Ensign is lowered for the last time during the decommissioning and handing over of Tarangau to the PNG Defence Force on 14 November 1974. A large and colourful ceremony marked the decommissioning of HMAS Tarangau on 14 November 1974 at which time the base was handed over to the then newly formed PNG Defence Force. At the same time, the five Attack class patrol boats were also transferred to PNG adopting the prefix Her Majesty’s Papua New Guinea Ship (HMPNGS) but retaining their former names. Arguably, the success of Tarangau was the cohesiveness of its ship’s company in such a remote locality and the ability of those serving there, and their spouses, to integrate and include members of the local community in much of its operation. Many of those who served in Tarangau made life-long friendships with the Papua New Guineans whom they lived and worked with during a time when forward defence was a central part of Australia’s Defence strategy.